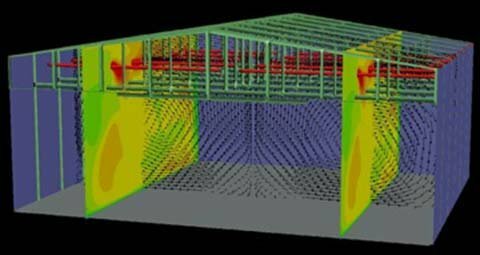 CFD modeling may be used to evaluate air currents and temperatures inside an aircraft hangar. Internal aircraft cabin contamination control and ventilation performance may also be modeled. A cross section is taken through a large aircraft hangar with radiant heaters in the truss sections supporting the roof. The radiant heaters are shown in red, trusses in green, building walls in blue, floor in gray and the ceiling is removed for clarity. Both radiant, conductive and convective heat transfer cause local temperatures of the support steel to rise significantly, while mostly IR radiation mildly heats the concrete floor to the building. Because of the differential in temperatures in the hangar, two large vortices form from thermally induced buoyancy. The velocity vectors are not color coded so they will stand out against the temperature contours.